Amaranthus is favorite accent plant and filler for wedding flowers, church arrangements, and cascading bouquets, due to its unique texture and bright colors. They blend perfectly with garden roses, orchids, and hydrangeas. Also, they come in several different colors, such as: green, red, and bronze. This particular flower has long, rope-like flowers that originate off thick green stems that can reach as high as 130cm. They are either upright or hanging as it is a large plant with bushy foliage sometimes known for its nutritional aspects. Its flowers are usually very small, with a soft, cotton-like consistency. Aztec Indians revered them and used them in many of their ceremonies so they have many qualities that make them very desirable. Call them showy, gaudy or exotic, Amaranthus or Amaranth as they are called are probably the best-looking flowering plants out there. The red color found in their flowers is the deepest and darkest shade of red that is produced naturally. It's also called Tampala, Fountain Plant, Tassel Flower, Joseph's Coat, Molten Flower and Love-lies-bleeding. It's a short-lived herb that mostly blooms in temperate and tropical climates. Amaranths species are not only cultivated as leaf vegetables or cereals but also ornamental and decorative plants. Their willowy flowy look makes them a really appealing accent to bouquets arrangement and table settings. The amaranth plant gets its name from the Greek word for invading. Correctly so, since this flower looks gorgeous even when not in bloom. 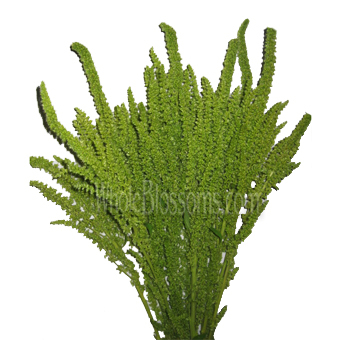 Its excellent elongated flora compliments the dark green foliage of the plant amazingly well. 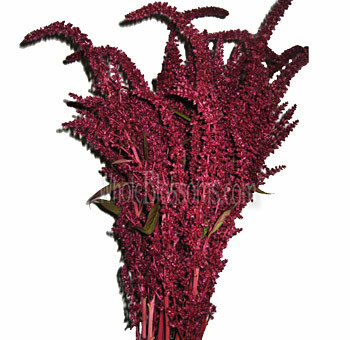 Amaranthus’s primary purpose is not only ornamental or for décor but also for consumption. Its leaves and seeds contain nutritional properties and are edible. The amaranth plant is rather large and bushy with oval leaves that change color according to the variety of the plant. The leaves start dark green or red at the bottom and turn to yellow on the top. The flowers themselves are tiny and usually a little prickly because of the bristly perianth and bracts. Amaranthus are used as edible grains and herbs all over the world. They are especially used for such purposes in Africa, China, Greece, India, Nepal, and Tibet as well as South America. The flower has a vast history ranging back to the Aztecs. They used it to make ritual drinks and food. Even today there's a unique sweet dish made out of Amaranth grains. The leaves of the flower are also highly nutritious and are described as spinach especially when they are plucked when tender and just blooming. The world has recently started discovering is nutritional value. This plant has nutritional as well as decorative uses. Amaranth boasts in beauty not just when in bloom but also when wallowing and especially when they are dried out. It's the only flower that manages to look charming and magnificent in all its stages of life. That is why they make the perfect addition to any décor or accent to any table setting and a perfect part of any bouquet. We absolutely love the hanging Amaranthus flowers at weddings. They are a perfect piece of décor to add to anything. From the wedding arch and aisle to the bride's bouquet. The color of Amaranthus is also beautiful and vibrant, and the way it drapes out of a bouquet or arrangement is fantastic. A perfect addition to a winter brides bouquet we highly suggest you use red hanging Amaranthus or dried out Amaranthus. The yellow and bronze Amaranthus are perfect for a fall, spring and summer wedding. Their texture and willowy nature make them an accent that creates attention around it. They stay upright, dense and even droop like tassels making them a unique and fun little part of any arrangement. The blooms come in vibrant, saturated hues and are incredibly eye-catching. The green amaranth flowers bloom from midsummer to fall when the flowers are completely grown. Green Amaranthus flowers are a sight to behold. The monochrome green arrangement is extraordinarily chic and minimalist. The red Amaranthus is a hybrid variety which looks stunning even on its own with its green and red foliage. 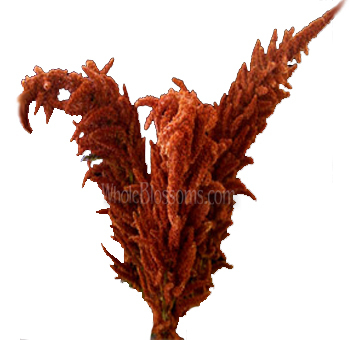 The red color of this Amaranthus is the most naturally occurring deep red. Amaranthus flowers look superb as a centerpiece. Paired with some other flowers Amaranthus makes an exceptional addition to any vase arrangements. But it’s in weddings and such events that these flowers truly get to shine. The bridal bouquet is one such setting where they can pack a punch. Yellow Amaranthus flowers are perfect for a summer or boho chic wedding theme whereas dried Amaranthus or purple Amaranthus is a beauty in winter themes. They are versatile enough to be used in almost every aspect of the wedding décor. Take for example the wedding aisle. 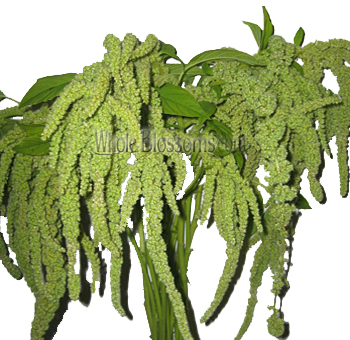 These hanging Amaranthus flowers would look amazing around you as you're walking down the aisle. They are magical, creative and romantic which makes them the right choice for wedding decors. However, make sure to cut the leaves off since they don't look really well most of the time. 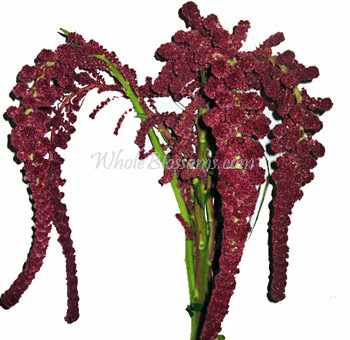 The Amaranthus flower is easily available from any online store. But we suggest you pick one that is trusted and can provide good quality at a good price. One renowned online wholesaler would be Whole Blossoms. Opt for going with them, and you will be guaranteed delivery of fresh flowers right at your doorstep. They even provide 24/7 delivery which is a lifesaver in cases of urgency.